As the autumn nights draw in and the chill in the air gets sharper, what’s more comforting than a freshly home-baked cake, filling your home with the scent of spice and sweetness? We have home baking recipes that use seasonal fruits, like apples and plums, with cinnamon and ginger, as well as traditional bonfire night food in flapjacks and parkin. Pre-heat the oven to 180ºC, gas mark 4. Grease and line a shallow 9” tin. Sieve together the flour and baking powder. Rub in the margarine until the mixture resembles fine breadcrumbs. Stir in the sugar, sultanas and apples. Make a well in the centre and add the beaten eggs and 2 tablespoons milk. Mix well. Add more milk as necessary to give a dropping consistency. Put the mixture in the tin and bake for 20 minutes. Lower the temperature to 150ºC, gas mark 3, and continue to cook for another 45 minutes or until a skewer inserted in the centre comes out clean. Cool on a wire tray and sprinkle with icing sugar before serving. Pre-heat the oven to 180ºC, gas mark 4. Grease and line an 8” cake tin. Halve and de-stone the plums. Reserve 10 halves for decorating the top of the cake and chop the remaining halves into small pieces. Sieve the flour, salt and 1 teaspoon cinnamon together. Rub in the margarine until the mixture resembles fine breadcrumbs. Stir in the sultanas and 3 oz sugar. Beat the golden syrup and eggs together then add to the flour mixture. Stir well. Mix in the chopped plums. Put into the cake tin and level. Arrange the plum halves on top. Mix together the remaining cinnamon and sugar and sprinkle over the top. Cook for about 2 hours until the cake is firm when pressed lightly. Leave to cool in the tin. Wrap in foil and allow to mature for 2 days – if you can wait that long! A moist cake that keeps well. If you heat the spoon before getting the golden syrup out of the tin it will slide off the spoon easily. Pre-heat the oven to 180ºC, gas mark 4. Grease a 7” sandwich tin. Put the butter, syrup and sugar in a saucepan and warm over a gentle heat. Stir until the sugar has melted and the ingredients blended. Remove from the heat and add the porage and a pinch of salt. Mix well. Place in the tin and flatten. Bake for 20-25 minutes. 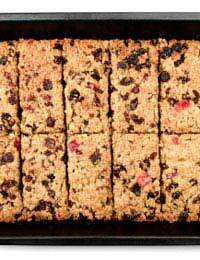 While the flapjack is still hot, take a knife and mark it into 8 segments. Leave in the tin to cool. It’s easy to make double this quantity for a bonfire party treat. Pre-heat the oven to 180ºC, gas mark 4. Grease and line a 9” square tin. Sieve together the flour, baking powder and ginger. Rub in the margarine. Stir in the oatmeal and sugar. Make a well in the centre. Place the syrup and treacle in a saucepan and heat very gently. When it’s runny and blended, pour, stirring, into the well in the flour mixture. Mix in the beaten egg and milk. Pour into the tin and bake for about 45 minutes or until firm to the touch. Leave to cool slightly in the tin before turning out. Parkin is best made about a week before you want to eat it to allow it to mature.